San Diego, California averages only 10 inches of rain each year. The average daytime temperature is around 70 degrees. For you, that means great weather for sightseeing and tours. Here are 12 sites you need to experience there. Fresh tortillas and the Birthplace of California wait for you in Old Town. This is also the place to catch the Old Town Trolley Tour for an overview of the city. Historic buildings, cemeteries and sites are sprinkled around this area and worth the search. It’s easy to walk around and discover and easy to stop and people watch at one of the many cafes. The State Historic Park is a more concentrated area to explore with authentic buildings, shops and demonstrations for free. Don’t miss the Old Town Market for shopping. You might want to explore the tequila museum with over 1700 tequilas at El Agave. You’ll also have fun eating at Fred’s, breakfast at Café Coyote is delicious and Café Pacifica makes a great Salmon. This is a wonderful place to walk, shop and eat. Over 70 miles of beaches are yours to explore. From La Jolla’s beautiful views to carnival atmosphere of Mission Beach’s Boardwalk, the beaches are a place to see and be seen. So much to do here that it’s hard to choose. Many head for Mission Beach but parents should consider the free spirited nature of this strip before deciding. The Mission Bay side is more family friendly. Coronado beach was voted best by the Travel Channel and in the top ten by Dr. Beach. They even have a leash free area called Dog Beach. Wherever you choose to dip your toes in the sand, enjoy, and remember that the water runs a little cool here. Built in1857, the Whaley House in Old Town is considered by many to be the most haunted house in the country. The U.S. Department of Commerce even declared it haunted. While many have reported experiences here that are hard to explain the most active spirit seems to be that of “Yankee Jim”. He was hanged at the site after trying to steal a rowboat. If you’re into all things ghosty, then the Whaley House is a must visit. Make sure to stop by the El Campo Santo historic Cemetery next door for even more thrills. Still not enough? Grab the Ghost Bus or take a walking ghost tour and hear the haunted tales of San Diego up close and personal. 16 square blocks of awesome food, vivid history, day and night entertainment and urban shopping make the Gaslamp Quarter a favorite with visitors and locals alike. The former “Stingaree” district known for it’s brothels and saloons in the 1800’s has been restored and transformed into an exciting hub of downtown social activity. From Horton Plaza shopping to the 150 handles of beer at the Yard House Restaurant there is something for everyone. So enjoy yourself in Wyatt Earp style at the Gaslamp Quarter. Try the Hawaiian Poke Stack at The Yard House. Yummy. “Impressive” best describes this seaside Victorian resort which opened its doors in 1888. It was a time of unlimited wealth and power when names like Rockefeller, Carnegie, Flagler and Vanderbilt took center stage. Grand Hotels were all the rage and Hotel del Coronado was special. Guests have included 10 U.S. Presidents, Legendary figures like Babe Ruth, Thomas Edison and Charles Lindbergh and celebrities from Charlie Chaplin to Brad Pitt. It even served as the backdrop for the movie “Some like it Hot” with Jack Lemmon, Tony Curtis and Marilyn Monroe. Beautiful architecture, posh history and legendary stories are waiting for you at The Del. Billed as one of the largest, most progressive zoos in the World, The San Diego Zoo attracts millions of visitors annually. Almost all of the exhibits are “open-air” which offers a better guest experience. Over 4000 animals make a day at the zoo unforgettable. If that weren’t enough, they also operate the Wild Animal Park with over 3,000 species in an even more open environment. Of course, the pandas are a big hit and animal births of all kinds get top billing. If you can’t get enough of animals, look no further. Balboa Park could be called “Museum Central”. It’s the nation’s largest cultural park and home to 15 major museums. Concerts, plays, musicals, classes and exhibits are constantly being offered here. One of the funny stories I heard involved commercial planes flying overhead to land at the airport during the outdoor show’s performances. It seems the cast learned how to time the songs and pause during the loud flyovers! The audience didn’t seem to mind. I really enjoy visiting SeaWorld. It’s fun, educational and exciting. You can navigate the park easily doing as much or as little as you want. Feeding the animals is a highlight, which is offered at select times during the day. This is a place you will probably get wet. If not at the fantastic Shamu show then a sting ray will likely splash you during feeding. Come here to have fun, relax and enjoy some of the best animal shows on the planet. When you think of Legoland, you might just think of toys. That is just the beginning here with over 50 rides, shows and attractions to enjoy. This is a very hands on place where everyone is encouraged to join in so don’t be bashful. Sure you’ll meet raving Lego fans but you don’t have to be one to enjoy this park. This is good old-fashioned fun at its best. By the way…don’t miss the incredible Lego sculptures there. Wow. What attracts us to these behemoths, I do not know. Is it their size? Their gentle nature? The songs? From late December to March you can decide for yourself when the Grey Whales migrate past San Diego. Their journey begins at the Artic Sea traveling down to Baja California where they give birth and then migrate back up again. It is one of nature’s greatest spectacles and not to be missed. You can spot them from shore at places like Point Loma but a whale excursion by boat is the best view. Getting close to these huge animals is really thrilling and watching them breech is astonishing. So bring a good camera and join the adventure. Cabrillo National Monument at Point Loma has a spectacular view of the City, the harbor and the Pacific coast. On clear days you can see all the way to Mexico. In winter, the grey whale migration draws big crowds. This monument commemorates the landing here of Spanish Explorer Juan Rodriguez Cabrillo in 1542. Here you can see the old and the new lighthouses and enjoy wonderful tide pools. It is a place to explore and offers the best views in town. What a busy place! Since this is an active military area the helicopters, planes and boats are constant. You can even see Navy Seal Special Forces doing dolphin and seal training. 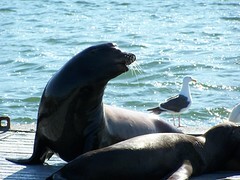 One of the best ways to take it all in is on a SEAL tour Hydra terra vehicle at Seaport Village. You cruise out on an amphibious vehicle to see pelicans, sea lions, planes and ships in this exciting harbor. Cool. San Diego, California is a perfect playground for lovers of history, mystery, sun, fun, food, shopping and unique tourist attractions. The people, weather and choices all blend together for a beautiful experience. I’ll see you there.